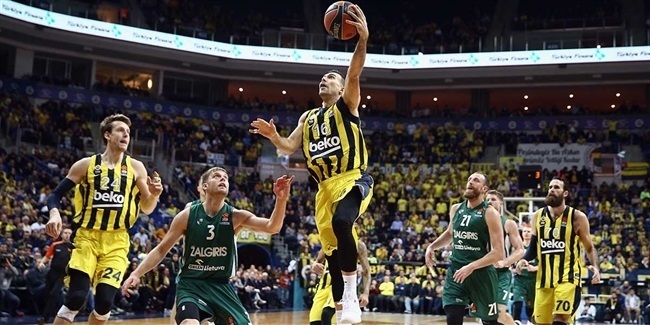 After the first quarter at Zalgirio Arena on Thursday night, it seemed certain that only one man would claim the post-game headlines. Georgios Printezis had fired Olympiacos Piraeus into a 19-29 lead over host Zalgiris Kaunas, scoring 14 points in the first 10 minutes on 4-for-4 three-point shooting. Even after Zalgiris stopped the bleeding in the second quarter, the three-point shooting masterclass delivered early by Printezis was simply continued by his teammates, with Kostas Papanikolaou, Janis Timma, Vassilis Spanoulis, Zach LeDay and finally Janis Strelnieks – right on the halftime buzzer – all netting from deep. The visitors led 40-48 at the break, having scored 30 of their points on triples. But then came the turnaround. 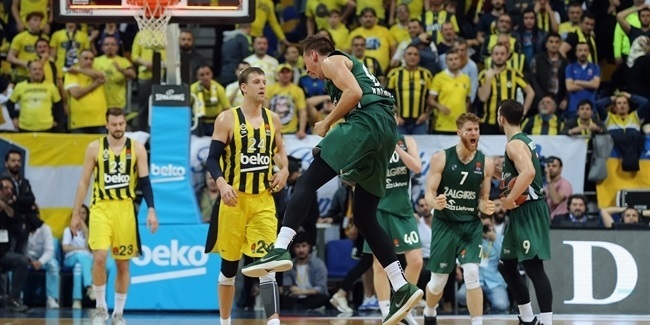 Spurred on by head coach Sarunas Jasikevicius and a passionate crowd, Zalgiris put up entirely different defensive resistance as soon as the second half got underway, preventing Olympiacos from scoring a single field goal for the first 5 minutes, 47 seconds. That allowed the home team to take a narrow, 60-59 advantage into the fourth quarter, which started similarly. Zalgiris held Olympiacos scoreless for 3 minutes this time, which effectively secure the eventual 83-75 outcome. Having scored 48 points in the first half, Olympiacos could only add 27 after the break. That was mainly because the Reds were couldn't get close to the basket at all, with Zalgiris claiming 16 turnovers in the second half after none in the first. 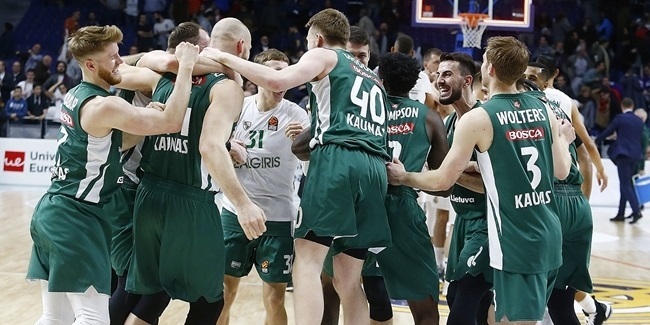 As so often happens, defense sparked offense and Zalgiris took advantage of those turnovers to claim a remarkable victory – its sixth in the last seven games against Olympiacos – and second straight at home after having started the season 0-5 in Zalgirio Arena.